India and Russia, original backers of the Northern Alliance that ousted the Taliban regime in 2001, have a host of common interests in ensuring peace and stability in Afghanistan. 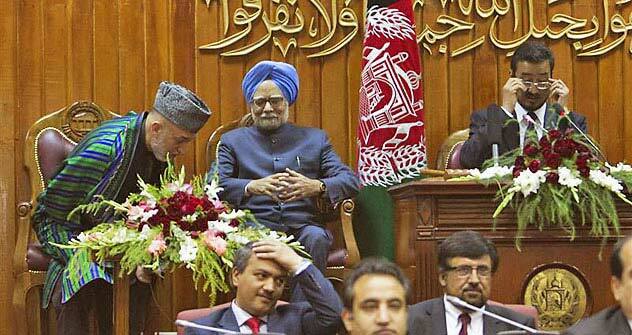 Indian Prime Minister Manmohan Singh recently concluded a two-day visit to Afghanistan. During this visit, he addressed the joint session of the Afghan Parliament and announced an additional assistance of $500 million to Afghanistan. India has already committed $1.5 billion to Afghanistan. The visit was very significant, especially as it came in the wake of the elimination of terror mastermind Osama bin Laden by US Special Forces and the planned withdrawal of Western troops from Afghanistan. India and Afghanistan have centuries-old historical ties. It was only during the period of Taliban rule in Afghanistan between 1996 and 2001 that India did not have any diplomatic ties with Kabul. This was also when an Indian airliner was hijacked to Kandahar in Afghanistan in December 1999 which ended when the Indian government released three dreaded terrorists in return for the hostages. Russia and India have many common interests in Afghanistan. Together with Iran, they propped up the Northern Alliance, which comprised soldiers from mainly non-Pashtun ethnic groups like Tajiks, Hazaras, Uzbeks, Turkmen and others. It was the Northern Alliance which played a leading role in the ouster of the Taliban in the wake of Operation Enduring Freedom. One cannot discount Russia’s crucial role in Afghanistan. In November 2010, Russia and NATO completed negotiations on an agreement which would allow NATO to transport supplies meant for Afghanistan across Russian territory. This meant that NATO could now transport critical military hardware to Afghanistan via Central Asia and Russia, thus reducing its dependence on Pakistan. Earlier, arrangements allowed only non-lethal NATO supplies such as food and fuel to be transported via Central Asia and Russia. Russia also faces the danger of Islamic extremism emanating from Afghanistan which has already had a disastrous impact on the Russian provinces of Dagestan, Ingushetia and Chechnya. Many of these extremists were trained in Afghanistan during the heydays of the Taliban. Moscow has been targeted many times in the past. Earlier in January this year, a bomb attack at Moscow's Domodedovo airport killed at least 35 people. India fears a Taliban takeover of Afghanistan as it would seriously impact the prospects of peace in its border province of Jammu and Kashmir, where militancy is on the decline. Besides terrorism, narcotics’ trafficking from Afghanistan is a threat to both India and Russia. India is also getting close to the Central Asian countries of Kazakhstan, Turkmenistan, Tajikistan, Uzbekistan and Kyrgyzstan because these countries are rich in oil and natural gas and have resources like uranium, which a booming Indian economy desperately needs. In fact, a deal for a pipeline from Turkmenistan to India, the TAPI (Turkmenistan, Afghanistan, Pakistan, India pipeline) was inked in the Turkmen capital Ashgabat in December last year. The TAPI pipeline will bring gas from Turkmenistan's Yoloten-Osman gas field through Afghanistan and Pakistan before terminating at Fazilka in India’s province of Punjab. Another point to note is that these five Central Asian countries are former Soviet Republics and still have strong ties with Russia. Iran is also another common area of interest for both India and Russia. Indian goods to Afghanistan and Central Asia have to go through Iran, because Pakistan does not allow the transit of Indian goods. Iran would be loath to see the resurgence of the Taliban since it is highly detrimental to Iranian interests. Iran has not able to forget the massacre of 10 Iranian diplomats in the border city of Mazar-e-Sharif in 1998 when Taliban soldiers took over the city. US President Barack Obama has already announced that he will begin pulling out the US troops from Afghanistan by July 2011 while the NATO at its Lisbon summit in November 2010 had announced that it would hand over the security of Afghanistan to Afghan security forces by 2014-end. However, like India, Russia has also expressed its concern with the proposed Western plan to differentiate between the “good” Taliban and the “bad” Taliban. Russia has stated that the Taliban must give up violence, accept the Afghan Constitution and break all ties with the Al-Qaeda, a stand which has found resonance with the Indian position which is on similar lines. Russia and India also have an interest in a stable and peaceful Pakistan since the country has emerged as a fountainhead of terrorism worldwide and both Russia and India would like to see that Pakistan does not give sanctuary to the Taliban. Russia is using its influence to see that Pakistan joins the rest of the world in the fight against terrorism. At the August 2010 Quadripartite Summit in the Russian Black Sea resort of Sochi, Russia, Afghanistan, Pakistan and Tajikistan agreed to step up the fight against terrorism and narcotics. India and Russia can also cooperate in reconstruction efforts in Afghanistan. India has built the 218-km Zaranj-Delaram highway in Afghanistan which will eventually link up with the port of Chabahar in Iran, which has been developed with Indian assistance. Incidentally Chabahar is a mere 72 kms west of the Pakistani port of Gwadar, which has been built with Chinese assistance. Russian companies are in the fray to refurbish many Soviet-era installations in Afghanistan, which include reconstructing hydroelectric plants and building wells in the Afghan hinterland. India has begun construction of the Salma Dam Power Project on river Hari Rud in Afghanistan’s Herat province. Russia and India have a tremendous stake in a peaceful and stable Afghanistan and, therefore, should expand their strategic cooperation to ensure a positive outcome in the violence-torn country. Dr. Rupakjyoti Borah is a Senior Lecturer at the Department of Geopolitics and International Relations, Manipal University. He was a Visiting Fellow at the Centre of International Studies, University of Cambridge, U.K. in 2009. The views expressed are personal.